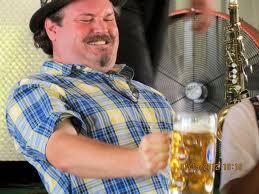 Oktoberfest starts Oct 7. Is your arm ready for mug-holding contest? Eins, zwei, drei. On cue, 13 men from across the country raise 13 massive, beer-filled steins out in front of their bodies with straight, outstretched arms. They hold them there, each of their brew-bearing arms parallel to the ground, one hand tightly gripping the mug’s thick glass handle. Their challenge is to hold up the 1-liter stein, known as a maßkrug (pronounced moss-KROOG), longer than any of their competitors. If they fail to keep the mug up and their arm parallel, or they spill any beer, they’re out. Trembling begins almost immediately. Teeth are clenched, breathing is deep, exhales loud. By the sixth minute, half of the contestants have given up; the remainder are struggling, their arms shaking. “Bring it up, bring that arm up,” shouts Lenny Coyne, the emcee and judge. A few minutes later, just two men are left standing: Zak Strauss, 27, a red-bearded fork-lift mechanic from Levittown, LI, and Cody Banes, also bearded, a 31-year-old who works at a bar in Sugar Land, Texas. Like all of the contestants, the two remaining men won regional contests to get here: the 4th Annual National Maßkrugstemmen Championship held last Saturday in Central Park following the German-American Steuben Parade. Moments later, Strauss’ arm falls too low, and he’s out. Banes keeps his focus, the national record in his sights. Nine minutes . . . 10 minutes . . . His wife is crying, anticipating the trip for two to Munich her husband has won. His mother shrieks from the audience. His brother cheers “Go, go, go!” along with the rest of the enthusiastic crowd. He lasts 11 minutes, 24.7 seconds, smashing the previous national record of 9 minutes, 59 seconds.